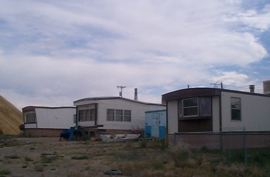 Foreign Investment in Industry in the U.S.
Three mobile homes in Ruth, Nevada. In the 1980's and 1990's, prefabs were advanced a step further with the introduction of mobile homes. Mobile homes are shaped like long rectangular truck trailers and are completely factory assembled. Truck drivers simply tow the mobile home on interstate highways to the building site. There, gas and electricity lines are hooked up and the family moves in. Homes have grown in size over the years: the average 1950's home was 1,000 square feet. Today's home averages 2,300 square feet. Because of affordable construction methods developed by the housing industry, the number of mobile homes in the United States nearly tripled between 1940 and 1990: from 37 million in 1940 to 102 million in 1990.